Echyridella menziesii and E. aucklandica are freshwater mussels, which live in soft-sediment habitats in New Zealand's rivers and lakes. Both species are known as kākahi throughout the lower North Island. They are tāonga species to Māori, valued both as a traditional food source and for providing tools. "Kākahi are pretty amazing. They have fascinating life cycles involving a parasitic attachment to native fish (including the whitebait species, which are now rare)," says Amber. "Unfortunately, anecdotal evidence suggests that kākahi are far less common now than they once were." E. menziesii is classified as 'At Risk–Declining', and E. aucklandica as 'Threatened-Nationally Vulnerable' by the Department of Conservation. Like many native freshwater species, kākahi suffer from human activity. Runoff from cities has seen an increase in copper, lead and hydrocarbons in waterways. Deforestation and erosion has increased the amount of fine sediment in lakes and rivers, which is smothering habitats. And the intensification of dairy farming means that effluent and fertiliser have entered the water, causing catastrophic changes. "Translocation is one of the tools we can use to help save these species from extinction—this will be the first well-studied kākahi translocation in New Zealand. From this we can develop a set of translocation guidelines for future efforts," says Amber. Last week 200 kākahi were translocated to the upper lake of the Kaiwharawhara Stream catchment, located in Zealandia ecosanctuary. It is hoped that, as well as contributing to the restoration of the ecosystem, the kākahi will have other positive effects. Freshwater mussels wear many hats—they are known to be pollution biomonitors, nutrient providers and trophic engineers. 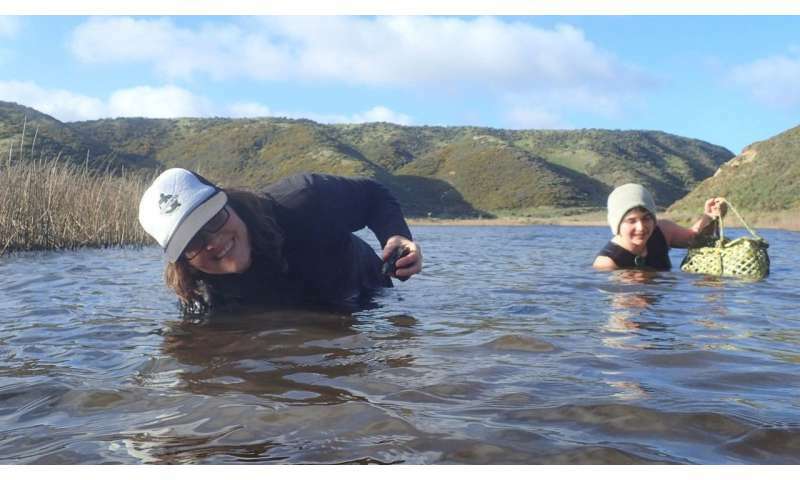 A single mussel can filter more than a litre of water in an hour, and it is hoped that the kākahi will play an important role in keeping the lake clean. Amber collaborated with Zealandia, Greater Wellington Regional Council, the Cawthron Institute, NIWA, Kahuguni Ki Wairarapa, Rangitāne O Wairarapa and Taranaki Whānui for the translocation and will continue to monitor the population via tiny microchips attached to the mussels' shells. "The translocation of two species of kākahi to a location in which they are not currently present will provide a unique and valuable opportunity to examine multiple ecological phenomena, such as colonisation and dispersal processes, niche formation, predation and competition," says Amber.